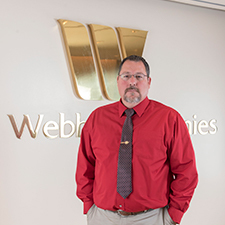 Dan Webster, Vice President of Building Services, supervises The Webb Companies’ team of skilled technicians who maintain each property. Building upon his military service background as an Engineering/Construction Specialist, he directs the operation of the computerized energy management systems, which are found in many Webb properties. Dan is thoroughly knowledgeable of all current building codes and standards, and works to ensure the safety and security of each of our properties. Dan is currently attending classes to achieve certification as a Certified Facilities Manager. He is a Kentucky Colonel and member of Disabled American Veterans. Dan is originally from Saline, Michigan and has made his home in Lexington for the past 15 years. He graduated from Sullivan University. Dan holds a Green Belt certification in Six Sigma and Design for Six Sigma. He has been involved in the construction/ building maintenance management field for over 20 years.